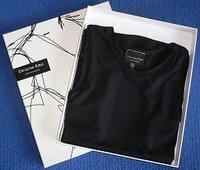 I receive many requests to review product and earlier this month I received one such request from Christina Ribel Couture in Sweden. I browsed the website and to be honest, at first I wasn't really impressed with what I thought was basic fashion; a range of long and short sleeved tees and tanks in just black or white. However, I received two samples, the Copenhagen Short in white and with a soft turtle neck, and the Visby Tank in black (see the pic below) and I have to say that I was very, very impressed! Christina's own words, "the unique Cotton, Modal, Elasthane combination creates a fabric that feels like butter when you wear it at the same time as it keeps you warm and covered." Finally, I just love the detail and fit; very flattering, stylish and feminine. Gives a real classy look! The collection consists of 18 different tops in various shapes and colors. Short or long sleeves, collars, v-neck, turtle necks and many other varieties are available. I'd like to see more colors but understand that Christina is seriously considering this. Also, I think that some stylish graphics, perhaps some arty "pencil" sketches or images would enhance the look. Notwithstanding this, I highly recommend the Christina Ribel brand and there's no better time to try this danish luxury embodied product than now as all orders received before December 1st will be delivered free of any shipping fee and if you order before December 1st, you will automatically be entered into a competition to win a $200 Christina Ribel gift certificate!